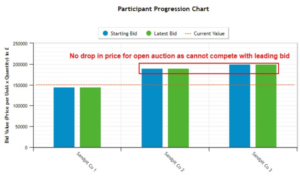 My last blog included some useful tips on how to get started with running reverse auctions within your organisation. As Customer Success Manager, I wanted to write this two-part blog to give you some inside tips on how to set up your eAuction, and hopefully make it a huge success. Throughout this two-part series, I will go through in detail, the parameters to setting up an eAuction in Market Dojo. Part one will cover the types of auction that Market Dojo offer, and part two will delve into the additional settings and considerations you may wish to make. This is where you have the opportunity to choose the type of eAuction that you want to run. We have 3 different types of eAuction available; Ranked, Open and Japanese. I will go through these in more detail to provide an overview and things to consider, but it is important to remember that there are many approaches that can be taken for an eAuction, there is no hard and fast rule. It would be great to be able to do some A/B testing and run the same eAuction event as a different auction type in parallel to see what really would be the best auction type for each event. Ranked auctions are by far the most popular auction type that we see, and is a very safe option to choose when running your eAuction. Ranked auctions are very effective when there is high supplier liquidity (viable suppliers), and it can be easier to overcome any supplier reservations due to the live feedback they will get in the auction (what other opportunity do they get to see live feedback on their ranking in the market against their competitors?) It also gives you more options when deciding who to award the business to, for example, you might want to take the top 3 suppliers through for a face to face discussion before any decision is made. Open auction – in an open auction, the leading bid is disclosed to the supplier, but the leading supplier details are hidden. 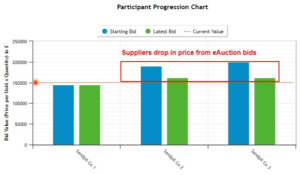 If the supplier wishes to place a bid during the auction, they must beat the current leading bid by the minimum decrement, e.g. if the leading bid is £100 and the minimum bid change is 1%, the supplier must enter a minimum bid of £99. Open auctions can be very effective at getting to the market value/lowest price much quicker than ranked auctions, but as a buyer, it can sometimes reduce your options, as suppliers can be scared off by the leading bid price. The below images show an example of the same auction for both a ranked and open auction. 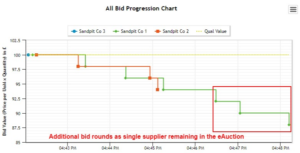 The first 2 images are from the ranked auction, the red and green line show the suppliers coming down in small steps, towards the current value and leading bid (blue). Suppliers 2 and 3 dropped from £190k and £200k to around £160k, producing a £30k decrease from their opening bids. The next 2 images show the same auction but from an open auction. As a supplier, if I am unable to beat the leading bid (£145k), unlike the ranked auction, I do not have the opportunity to place bids in small decrements, so I will walk away from the auction at my initial price of £190k and £200k respectively. Therefore, as a buyer, if I don’t wish to move forward with supplier 1, I would have the option of supplier 2 or 3 for an additional £45k or £55k respectively. Whereas, in the ranked auction, I could move forward with the same suppliers for an additional £15k following the auction. Japanese Auction – in a Japanese auction, the starting price of the auction is set by the buyer. The buyer then decides as a percentage, how much the price will reduce across a set time interval. For example, the starting price may be £100, and the buyer will set a bid percentage decrement of 2% (£2) every 1 minutes. The suppliers simply have to state if they accept or decline at the bid level. If they accept the supplier continues through to the next bid round, and this will happen indefinitely, until all suppliers have declined. Rather uniquely, the auction will run/continue, even if there is only a single supplier involved. Japanese auctions are extremely effective when there is low liquidity in the market as suppliers receive very little feedback. They are completely in the dark concerning how many others they may be competing against, and instead are battling with themselves to offer a the good or service at the new lower price requested. As mentioned above, a forward Japanese auction can be very effective at negotiating rebates. The price continues to increase at a set percentage across a set time interval, and because the auction continues when there is just 1 supplier left, you can continue to negotiate with those suppliers too. 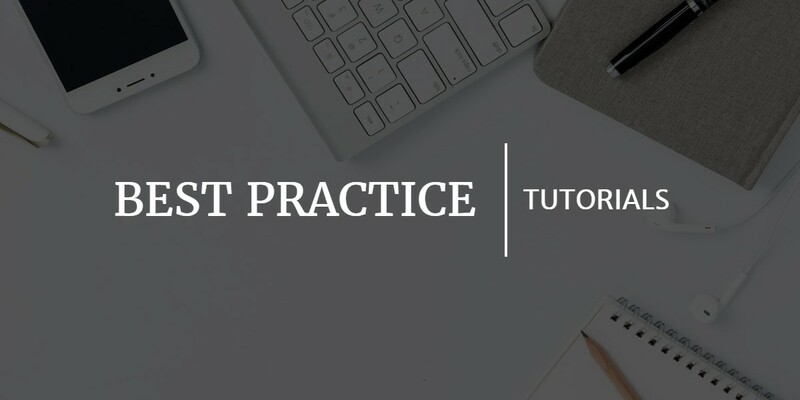 In the next part of this series, I will discuss the parameters of setting up the above types of eAuction and the additional settings and considerations that are available to make your events more effective.